The Battle Arms Development Frictionless Straight Trigger has an adjustable two stage trigger pull ranging from 2 to 5 pounds with click feedback indications. 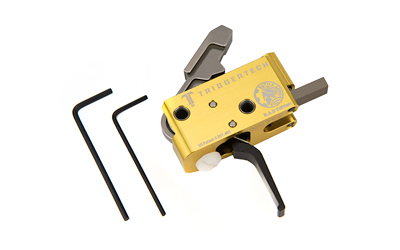 The triggers Frictionless Release Technology eliminates trigger creep. The two stage trigger was designed to feel similar to a 1911 trigger. The Enhanced Reset Control has a short .030" reset. All internal components are made from 440C Stainless Steel and the trigger housing is made from 6061 anodized aluminum. Designed for standard Mil-Spec receivers with .154" pin holes (pins not included).